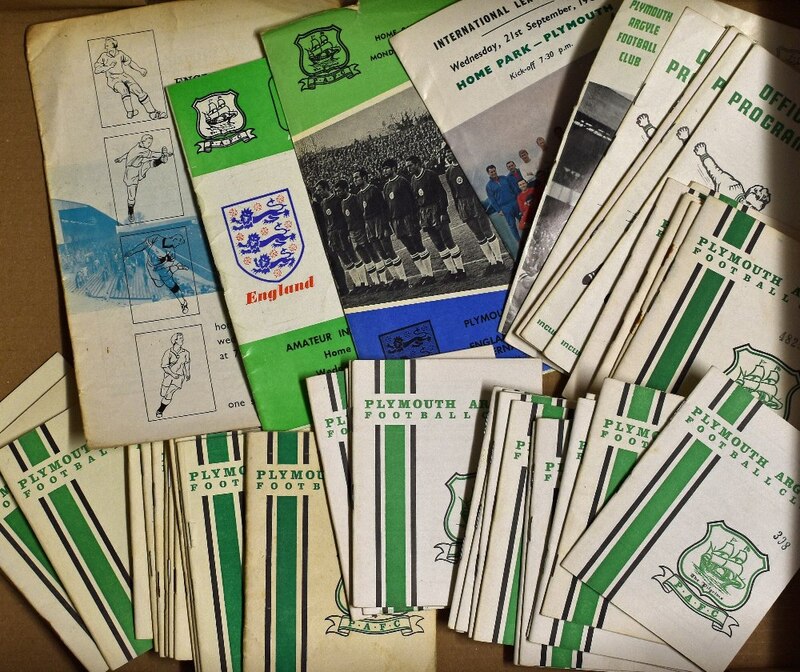 Collection of Plymouth Argyle home match programmes to include 1964/1965 Huddersfield, Manchester City, Derby County (FAC), Portsmouth, 1965/1966 (9) including Manchester City, Portsmouth, Huddersfield Town (FAC), Ipswich Town, Southampton, Norwich City, 1966/1967 (15) including Wolves, Northampton Town, Bristol City, Blackburn Rovers, Bolton Wanderers, Carlisle Utd, Crystal Palace, Millwall, 1967/1968 (5) Birmingham City (FLC), Cardiff City, Blackburn Rovers, Rotherham Utd, Huddersfield Town, 1968/1969 (6) including QPR, Hartlepools Utd, Mansfield Town, Gillingham, 1969/1970 Reading. 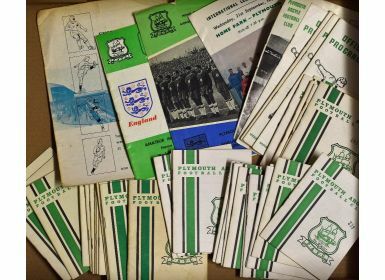 Also noted are 1962/1963 England v Belgium U23’s, 1966/1967 Football League v Irish League, 1972/1973 Plymouth Argyle v England Amateur XI, England v Finland Amateur international 4 April 1973. Total (43) (1 box) Generally Good, worth a view.